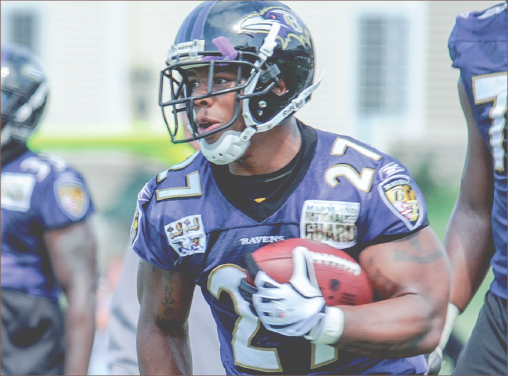 Following Monday’s release of the shocking elevator video that has been shared by sports sites, social media and news outlets alike, former NFL superstar Ray Rice was both fired and suspended indefinitely from the NFL. The TMZ Sports video showed the actual altercation between Rice and his fiancée Janay Palmer. The couple was seen entering the elevator before Palmer rushed towards Rice, who then viciously hit Palmer. Palmer’s head struck the elevator railing, and she collapsed to the ground, unconscious. The release of the video was a surprise twist in a case that was all but wrapped up, as Rice was set to return from his controversially short two-game suspension last Friday. After the video was released, the true events of that February night were revealed, and Rice’s fate changed dramatically. All that had been seen prior to last Monday, Sept. 15, was another TMZ video of Rice dragging Palmer out of the elevator after the altercation had occurred. This left the events of the actual incident a mystery, and that proved to work in Rice’s favor. Rice and Palmer met with NFL Commissioner Roger Goodell July 16 to discuss the incident. A week later, Goodell handed down a widely criticized two-game suspension, meaning Rice would be able to return after the second game of the season, which would have been last Friday. The release of the video Sept. 15, changed that. After seeing the video, the Baltimore Ravens felt they had no choice but to terminate Rice’s contract, effectively firing him. The NFL also suspended Rice indefinitely. On top of everything, Goodell is facing heat because of an Associated Press report that claims Goodell saw the video of the elevator altercation, yet gave Rice the two-game suspension anyway. The NFL hired former FBI director Robert Mueller to conduct a private independent investigation into how the NFL handled the Rice case. If evidence of a cover-up is exposed, the NFL and Goodell will be facing heat of scandalous proportions in the days to come. This case has brought an issue into the public eye that really transcends football. Violence against women is a major issue today. The NFL must address this issue in a big way going forward, not only because it is the right thing to do, but because they must make the statement that violence against women is wrong and must be stopped. And they must do so with the entire world watching. The Rice case is about much more than football. It is about making a statement concerning an issue that is prevalent in our country today, and truly needs to be addressed. The NFL must make a concerted effort to show that there is no tolerance for domestic violence in the NFL. Effectively emphasizing no tolerance for domestic violence is not only important for the NFL going forward, but it is also an important message to send to the NFL’s vast audience as well. It is never okay to commit such an act as Rice did, and he is finally seeing the consequences for his actions. Hopefully these consequences will prevent others from doing the horrible things Rice has done. You are an awesome writer!! I really enjoy reading your articles.